Create understandable order statuses to effectively manage orders on the grid. Also inform customers about order status changes to keep them devoted to your store. Easily create speaking order statuses to increase order management effectiveness. You will also be able to sort orders by these statuses. +1 way to keep in touch with customers. Order status is an important means of communication with customers. Providing relevant information in the status is crucial in building customer trust. Let customers feel that they are cared about. They should see that your store is secure and responsible in doing business. Make order management simple and clear. Create intelligible order statuses and you'll know what to do with each order without checking the order page or other sources. This will save you hours of work and efforts and let you reduce order processing time. 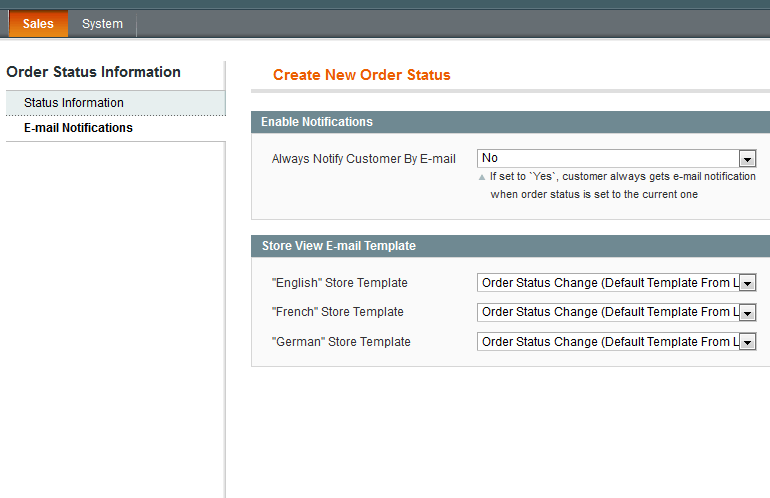 Now you can flexibly notify customers about Magento order status changes. In the sphere of E-commerce it's very important for customers to know what's happening to their order. And store owner must keep customers to date about their orders. 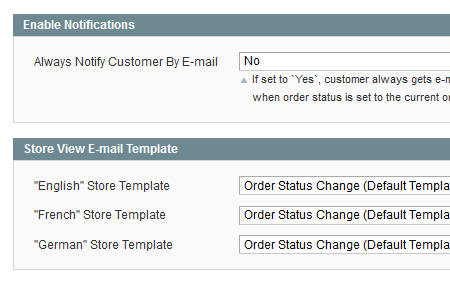 With our module you can use a separate email template for each order status to properly inform your customers. Manual or automatic order status change notifications. You can enable or disable automatic dispatch of notifications for each status or manually send notifications only for particular orders. Also it is possible to use a separate email template for each store view. Sort and filter orders by their Magento custom order status. You have an ability to sort and filter orders by order statuses. This feature adapts Magento to your needs. Create additional order statuses for each order state. And after this step you'll be able to choose with which order states each order status can be used. Yes, you can enable/disable automatic 'order status change' notifications or send the notifications manually for definite orders. Besides, a unique email template can be applied to each store view. Follow a step-by-step guide to make everything on the first try. Yes, you can send an email notification on a status change and choose a separate email template for each store view. Continue reading to see the screenshot. 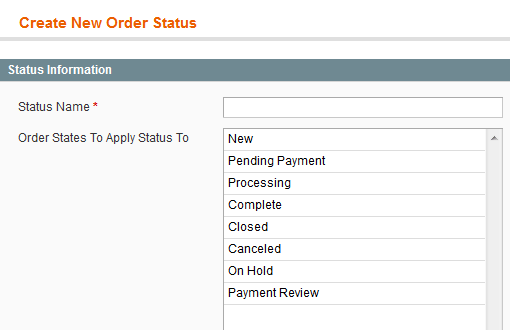 Yes, when creating a new status you see numerous option: order status 'pending payment', 'new', 'on hold', etc. To delete an unnecessary status you need to assign it a complete or closed state and delete it in the edit order status settings. Can custom emails include attachments? This option is available only with customization. Module works perfectly and the support was excellent. Been using this extension for the last 5 years without an issue. It helps us tremendously better track the pick, pack and ship process within Magento, without harming Magento's default order status flow. Thx Amasty! Really easy to use, simple, perfect! was a little conflict with another extension and the customer support, fixed this really fast!! First-rate! It works exactly as written in the description. Our sales staff is extremely happy! Works nice with all Magento versions. No problems at all. To tell the truth it is one of my best purchases for my web store. I want to say a few words about extensions and the whole customer service by amnesty. I have tried the first extension a few years ago, and I was pleasantly surprised with such great service. All my issues were solved in 1-2 days. Years passed and the service becomes much better. That's why I will give 5 stars to Amasty. The best way to inform customers about order status. when we change the order status each our customers will know it. And in addition customers can see the order status in their customer's account, it means that there is no missing now. Good extension to inform customers about their orders. When the order changes the status we will inform the customer about this action. We do it not to confuse customers and not to surprise them. The extension matches all features which are described. Sometimes we need to create additional order statuses for our orders. And I should mention that our web store has different store view for different languages, and Order Status extension helps us use different email templates for each store view. It seems like a small feature but it suites for shop which has more than 1 store view. I have read lots of information about different extension with the same features, but amasty order status has the most comprehensive list that i need to manage my order status. I try to inform each customer about order and what happens with his order. And as in description was written it helped me to become closer with my customers. The extension helped increase profit of my shop because customers' loyalty and trust level brought to a new level. I have a multistore with Magento v 1.5. I can't work with the native Order Statuses, so I bought Order Status. Installation is easy. Making new Order Status is very, very simple. I translate the transactional email template in dutch and now all my stores get the right email. Futhermore I translated text with Inline. I had however a (small) problem with showing the notification in the backend. It was caused by a limitation of the max symbols in Magento. Alex from Amasty solved the problem in no time. First contact in one hour! He increased the columns size in the table where Magento stores order status. By default it's limited to 32 symbols. It works fine now. I recommend Amasty for its extention AND the quick service. Always reply fast easy installation as well and competitive price . We have dill with many companies in the past and I can rest a sure you this guys are professionals ! We were looking for CRM for magento and find out it will cost a lot and not always will be so efficient. The combination of the flags >order memos and attachments > order status extensions gave us the abele to handle a very large amount of orders with no need to import or export anything all from our back end with the same look and feel we know. I will highly recommend to any one! Thank you very much for the great support I've received - Amasty will certainly be at the top of my list for future purchases. This is a great extension, worth every cent (and more!). Magento's default states is so limited and the extension makes life very easy. Another great advantage is that you can attach a different email to be sent out with each status you create (as opposed to one version only when you use the comments box of Magento). 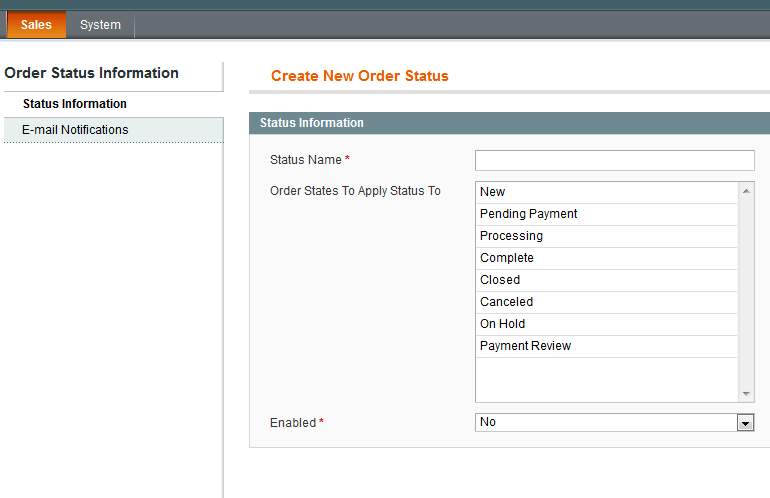 – Possibility to send order status change notificatons to customers. – Admin can enable/disable automatic dispatch of notifications for each status or manually send notifications only for particular orders. Also admin can use a separate email template for each store view. – Possibility to choose with which order states each status can be used. – Fixed issue with translations. – Editing of existing order statuses. – Maintenance release - bugfix.